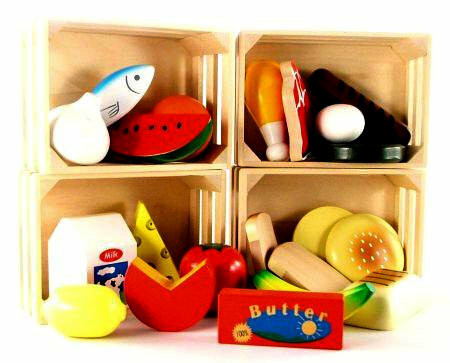 Wooden Play Food Baskets These 4 food baskets are packed full of wonderful produce in lovely bright colours. Each basket has it's own theme Dairy, Meat & Fish, Bakery Items and Fruit. The whole set comprises 21 beautifully finished wooden pieces. This is a fantastic toy for playing markets, shop or cooking (for those demanding dollies, teddies and long suffering parents). The large selection of food and 4 well made wooden baskets means you can arrange and re-arrange your market display. The Fruit Box has a Tomato, Orange, Onion, Banana, Watermelon piece and Lemon. The Dairy Basket has a Carton of Milk, an Egg, a round of Cheese, Butter, and Swiss Cheese. The Meat Basket has a Steak, Hamburger, Sausage, Drum Stick and Fish. The Bakery Basket has a Loaf of Bread, Hamburger Buns and 2 pieces of Bread. We like this because: "It is a beautiful, solid, well made toy that provides hours of imaginative play."